Bus will leave Common Ground Counseling (639 Main St.) at 10:00am and arrive at the rally start site in Norway at approximately 11:00am. After the rally’s conclusion at approximately 2:00pm in Paris, the bus will depart and return people to Common Ground Counseling in Fryeburg. 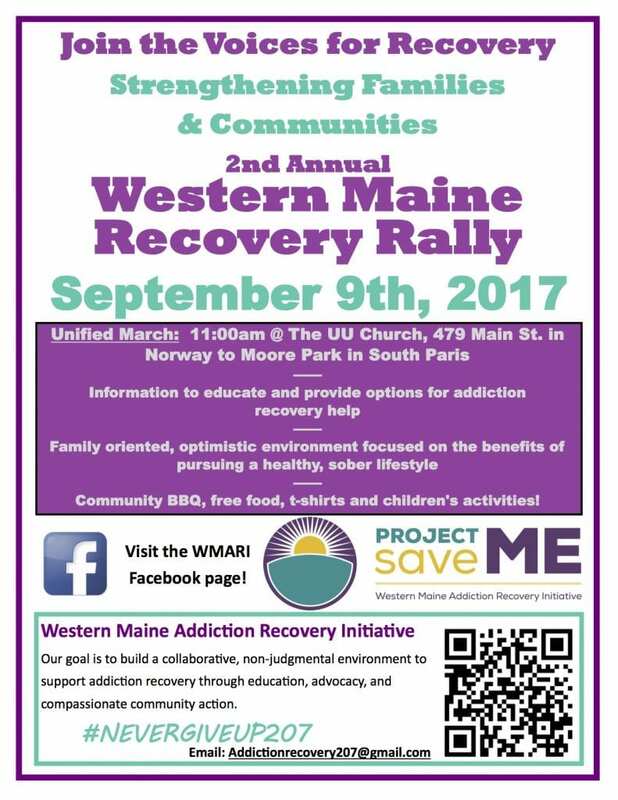 Please RSVP by contacting Michelle Roberts at addictionrecovery207@gmail.com or 381-0486. This bus in being generously provided by Bennett Transportation. A bus will leave Common Ground Counseling (89 Main St.) at 10:00am and arrive at the rally start site in Norway at approximately 11:00am. After the rally’s conclusion at approximately 2:00pm in Paris, the bus will depart and return people to Common Ground Counseling in Fryeburg. Please RSVP by contacting Michelle Roberts at addictionrecovery207@gmail.com or 381-0486.This bus in being generously provided by Ride Source. Another bus will leave the First Baptist Church (20 Roxbury Rd.) at 9:30am and arrive at the rally start site in Norway at approximately 10:30am. After the rally’s conclusion at approximately 2:00pm in Paris, the bus will depart and return people to the First Baptist Church in Mexico. Call 207-364-8712, option 2, for a ride. This bus in being generously provided by the First Baptist Church of Mexico.